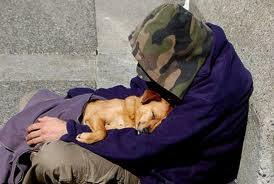 Stapleton House in Boston, the only shelter of it's kind, has a goal is to help out homeless men and homeless dogs. Unfortunately Stapleton House only houses 11 men and only 1 dog at a time. The goal is to get the rescued dogs to permanent homes. Stapleton House on Pine Street in Boston is not an emergency shelter. It is a transitional housing shelter. Pairing homeless men with dogs is a great idea as homeless men and stray dogs oftentimes create a special bond between one another. In my visits across the US and Europe I have often found that homeless men many times have special relationships with dogs. Hopefully over time this can be expanded and more transitional housing shelters can start providing services like this. This idea just sounds like a win win situation for everyone.